The Protect & Shield System has been chosen as the “Official Anti-microbial Program” for the NCWA. Protect & Shield is a simple “do it yourself” multi-stage process to help protect your mats equipment and facilities against surface bacteria and fungi including MRSA and Ringworm. The chemicals used in Protect & Shield have been used on the facilities of West Point Military Academy, Miami Heat, Minnesota Vikings, Washington Redskins, Atlanta Hawks, University of Tennessee at Chattanooga, Ohio State University, and the list goes on. 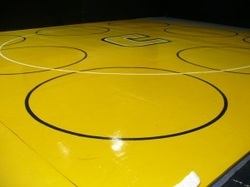 While no product or methodology can prevent all skin infections in a sport where there is skin to skin contact, proper cleaning, disinfecting and antimicrobial coating applications are the best way to prevent disabling skin infections from being spread through mat, clothing and equipment contact. The National Collegiate Wrestling Association is committed to giving all student athletes involved in NCWA wrestling programs the best possible protection against skin infections including MRSA. Thoroughly clean mats with mild detergent and water to remove ground in dirt and soil that can host microbes. Allow clean mats to dry. Mix the 1/2 gallon container of Protect & Shield Concentrate with 3 parts water making 2 gallons of ready to use coating. Apply the remaining 1 & 1/2 gallons of mixed anti-microbial coating to a standard 42 x 42 mat as evenly as possible. The remaining 1/2 Gallon of premixed Protect & Shield should be used within 48 hours to treat all team headgear, Knee pads, jump rope handles, weight benches, throwing dummies & weight hand grips. Concentrated Protect & Shield can be mixed, 4 oz into laundry rinse cycle for treatment of Singlets, Workout Shirts & Shorts as well as warm ups. Anti-Microbial effectiveness remains through multiple washes up to 30 cycles before re-treatment is recommended.